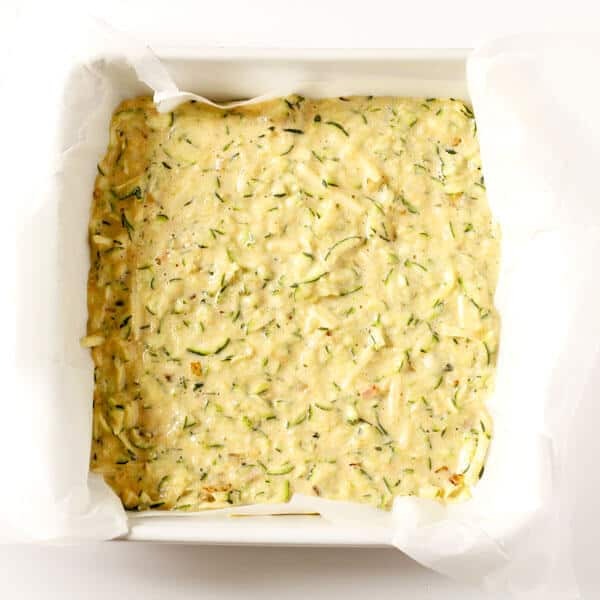 This healthy zucchini slice is perfect for meal prep – quick and simple to whip up and absolutely delicious! Enjoy as is or throw in some extra veggies for something different! When it comes to crowd pleasers, the humble zucchini slice has stood the test of time. A quintessential “Aussie” cuisine, you can generally find the slice packed in school lunch boxes, or served at parties alongside cheerios (not cereal – cocktail frankfurts) and fairy bread (white sliced bread covered in butter then sprinkles). Kids love it. Adults love it. People who swear they’d never touch zucchini with a ten foot pole love it. And if you’re yet to experience the wonder that is THE zucchini slice, you’ll love it too. As with most things, I like to put a healthy spin on beloved recipes where I can. I’ve subbed in a few healthier alternatives and the result is a perfectly balanced zucchini slice that makes no sacrifice in the taste department. Zucchini slice is VERSATILE. Enjoy it as is for a quick on-the-go breakfast, or pop it alongside a side salad for lunch and dinner. Or take a plate of it to your next gathering. Believe me – there’s no occasion where the zucchini slice doesn’t shine. Wholemeal Flour – This slice works well with plain white flour (a.k.a. all purpose) as well as gluten free flour, so feel free to substitute with what you prefer. 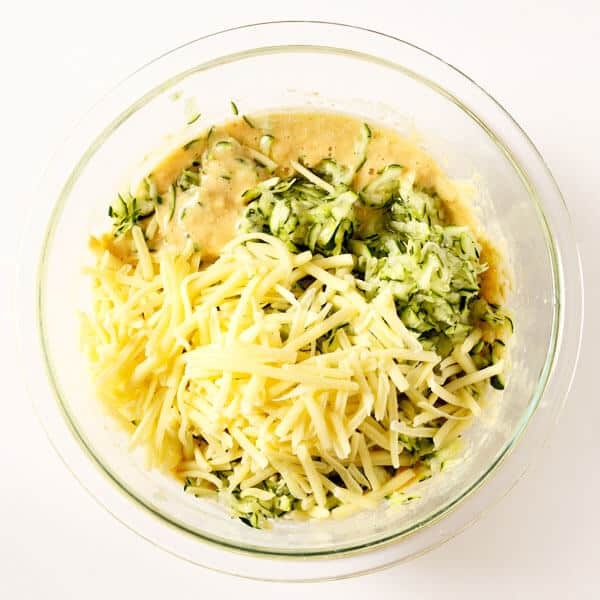 Cheese – I usually use what we call “tasty ” cheese for this recipe, which is essentially cheddar cheese. I have made it quite a few times with lactose free cheese, which also worked well. Traditional zucchini slice calls for bacon. If this sounds good to you, grab 2 bacon rashes, remove the rind and dice. Then cook bacon and onion in a frying pan before adding to the mixture. If you want to up the vegetables, I’d recommend trying my bacon and vegetable slice. One of life’s great disappointments is making baked goods with zucchini that is insufficiently drained of liquid, and ends up coming out a soggy mess. Don’t let zucchini play you like that! Follow these easy steps and you’ll never have a soggy kitchen mishap again. 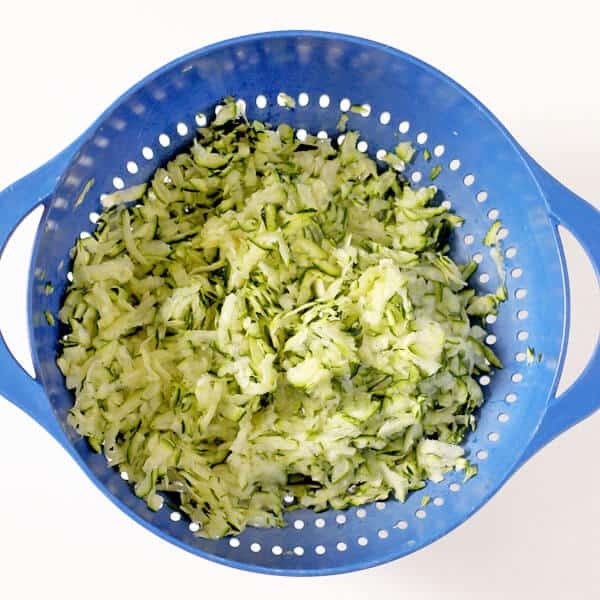 Grate zucchini into a colander. Put the grated zucchini in a clean dish cloth and wring out over the sink, OR wring with your hands, grabbing a handful of grated zucchini at a time and placing in a seperate bowl as you go. Tip: For this recipe you don’t need to be militant in your removal of the zucchini liquid. Just give it a wring and pop it in the ingredient bowl (as per step 3 in the recipe instructions). A little moisture left is OK and won’t effect the end result. Slices placed in an airtight container in the fridge will keep for about 5 days. Slices placed in an airtight container, or zip-locked bags in the freezer will keep for up to 3 months. To defrost, simply place in the fridge overnight and allow to defrost completely. 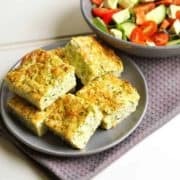 How to reheat zucchini slice? You can reheat the slice in the microwave or the oven, or just eat cold (my personal favourite). 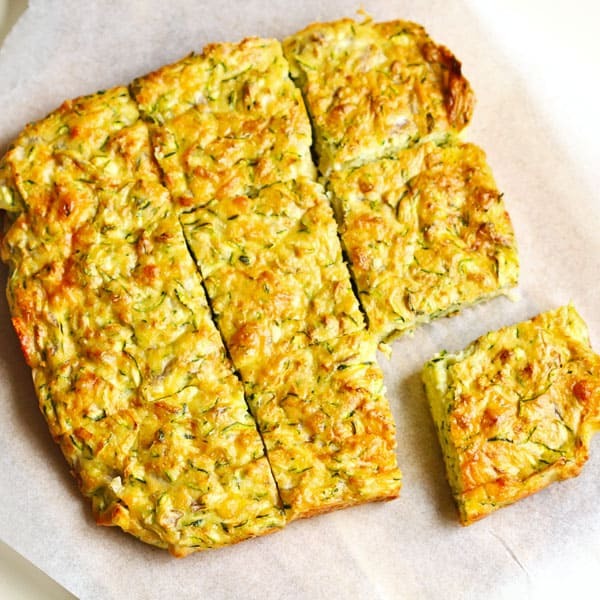 If you’ve tried this Healthy Zucchini Slice I’d love to hear how you enjoyed it! Pop a comment and a star rating below! You can also FOLLOW ME on FACEBOOK, INSTAGRAM and PINTEREST to keep up to date with more delicious recipes. 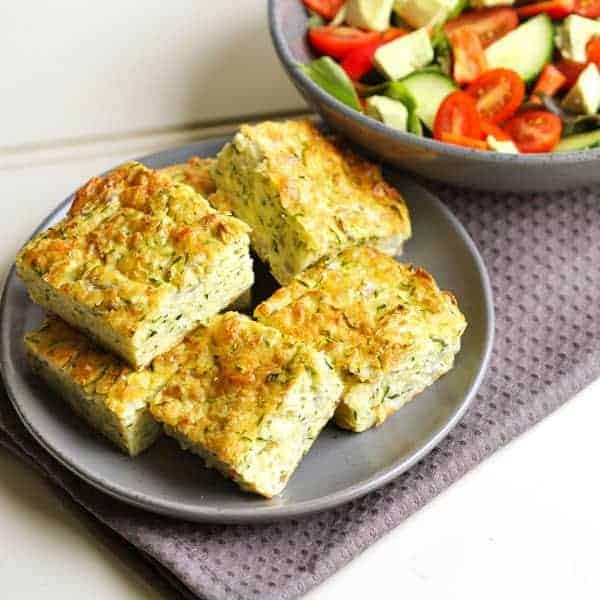 A healthy zucchini slice that can be enjoyed as a light lunch, snack or breakfast on the go. Whisk eggs in a large mixing bowl. Add flour and baking powder and mix until smooth. Cut into 9 slices and serve on it's own or with some hummus on top! PREPARING ZUCCHINI - Be sure to wring the grated zucchini out before mixing in with the ingredients to remove excess moisture. STORING - Store in an airtight container in the fridge for up to 5 days, or in the freezer for up to 3 months. To defrost, place in fridge overnight. REHEAT - Reheat in microwave or oven, or eat cold (my favourite). UPDATES - First Published January 2, 2018. Last Updated December 10, 2018. No changes to recipe, simply updated photos and tips. NUTRITION - Nutrition is a rough estimate based on one serve. Absolutely delicious! My family’s favourite zucchini slice and so easy to make! I can’t imagine being that cold, but what an incredible experience that would have been in Canada! So different from the heat here in Australia though, haha! Thanks lovely! It was a really different experience for sure! I can now never complain about a Brisbane winter ever again! Zucchini slice is my absolute favourite go-to recipe. I generally end up chopping up any left-over veggies I have for the week and throwing them in too. I haven’t tried using wholemeal flour before, so i’ll give that a try for next time! Great tips. I think it’s a real aussie thing haha! But the more veggies the better! wow!!! so yummy!! I love all of your recipes!! Ooh, such a simple recipes, alternative ideas with different ingredients,Thanks for the recipe Cassie . Thanks Aria 🙂 Glad you liked it! So simple and so delicious! I’ve never thought to try something like this, but definitely need to. Thanks for sharing!